One of 1981’s biggest hits, Shake It Up was also one of The Cars’ first breakthrough hits. A natural for the Top Five, it laid a claim to the charts that the band would take advantage of many times throughout the decade. Ric Ocasek leads the group during this feel good track. It’s got a driving beat, lyrics that make it easy for fans to sing along with, and a danceable groove that still makes people move. Radio continues to have a love affair with this one, as do listeners the world over. 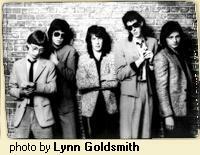 For a punk band, The Cars really crossed over into the mainstream in an effective way without losing their signature sound, as is expertly displayed by Shake It Up. One of the first music videos to go into heavy rotation on MTV, Shake It Up is a fun blast from the past that still sounds contemporary. Ric, Ben, and the boys were in for a nice ride at the apex of their genre and Shake It Up proves why in grand style.